Every one has someone they have looked up to for words of wisdom and direction. One of mine is that of my Grandfather who was 96 years old and married to his sweetheart for 75 years! For those who had the honor to know this sweet couple, they were often seen holding hands at any moment. 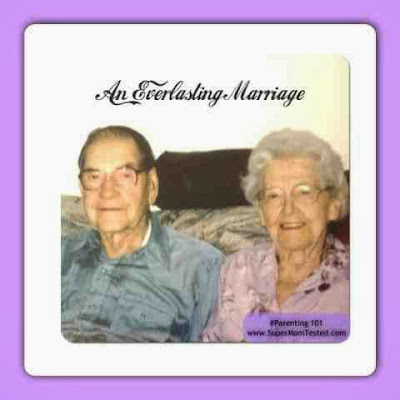 I was very concerned about being married again and desiring to have a strong relationship like that of my grandparents. I asked my Grandfather what is his secret to an everlasting and loving marriage. I have been married for 7 years August 2013. I have a wonderful and supportive husband, my favorite man in the world at my side. He completes me and I excel in this life because of his belief in me. He is the kind of man I want to grow old with as we journey in this life and the next side by side. I love that I miss him when he is gone. I love that I still get chills when he walks into the room. I love that even after 7 years we still flirt with each other. I laugh the hardest when he is with me. I smile often and long for his warm gentle touch. We both learned from our first marriage that's its the small things that matter most. As I was organizing some papers (my worst type of kryptonite, but that a story for another day) I happened to find a hand-written letter from my Grandpa, sharing with me his powerful words for keeping a marriage strong. These are directly from his letter and in his words. 1) Have everything in common, "This is mine, that is yours" none of that. 2) Make all important decisions together. 3) Stay out of debt. If possible, pay for items when purchased. 5) Have family time every week. 6) Obtain and live up to personal values. 7) Maintain controls of your tongue. Think before you speak. 8) NEVER make a decision while your angry. 9) Keep a sense of humor. 10) Always be willing to change your decision to aid your companion. 11) Always plan things together and be willing to give. 12) Remember you can always call upon the Lord for help. I've always been taught to look up to the example of those who have what you want. I am grateful for these nuggets of heartfelt knowledge from him. My sweet Grandma (Leora Leamaster) passed away Nov. 2010 (She was 92 years old). Grandpa(Vernon Leamaster) passed away May 2012. (He was 96 years old). I'm so grateful to have had thier influence, love, support and memories to enrich my life. And will do my best to carry on their legacy. BY Stephanie Goodman: SuperMom of 3 & 2 bonus sons.